My friend Nicole (from Welcome to Colie's Kitchen) is soooo lucky! 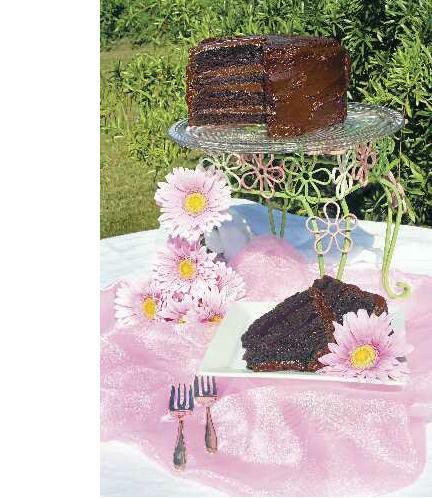 She recently had the opportunity to do a product review for Daisy Cakes. Nicole and her family taste tested a Chicken Pot Pie, comfort food at it's best! You can read her review here. I checked out the Daisy Cakes website and have to say, the cakes look scrumptious! Especially this CHOCOLAT-A-YA-YA. This cake reminds me of a cake I used to order for special occasions when I still lived in the city. MMmmmm! In addition to doing a product review for Daisy Cakes, Welcome to Colie's Kitchen is also hosting a giveway for a 4 layer 24 Karat Cake from Daisy Cakes. Let me just say, ever since Nicole posted her review with the link to the Daisy Cakes website, I've been dreaming of Carrot Cake. Daisy Cakes 24 Karak Cake Giveaway ends August 20th. Welcome to Colie's Kitchen is also hosting another giveaway. This one is for a Slap Ya Mama gift bag of assorted spice mixes. This giveaway is right up my alley! As much as I love my sweets, I also love spicy foods! Joe often goes to sportsman conventions and he always visits the spice booth. Of course he has to bring something home for us to try! And in all these years, we've never come across the Slap Ya Mama brand! I sure hope we win this gift package so we have the opportunity to cook up some spicy foods with their spice blends! Since I'm such a nice person (and I've already made you all crave carrot cake), I figured I'd share this giveaway info with you as well! Click the link below to find out how to enter for your chance to win! 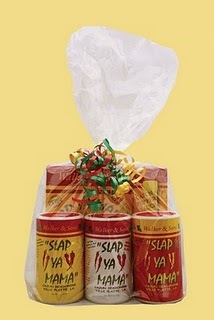 Slap Ya Mama Gift Pack Giveaway ends August 25th.